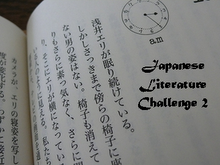 Dolce Bellezza is hosting the Japanese Literature Challenge 2. I didn't participate last year, but there are a few books on my radar this year that would qualify for this challenge. I can't believe how much my reading has broadened in the last year. This is a perfect example, as now I know three different authors that are Japanese, and I don't think I could say that last year. Read 3 books of your choice between July 30, 2008 and January 30, 2009. I'm really looking forward to reading After Dark and would like to read something else by Miyabe and Ishiguro too. Have fun with these. I just signed up for this one as well but haven't put together my list of books. I do want to read something by Murakami, though! I'm almost finished with Never Let Me Go, my second Ishiguro novel. bookfool - I wasn't sure about Ishiguro, so I asked bellezza first. I saw his name on anohter list, and I think the one I listed is set in Japan/China. trish - I loved Never Let Me Go. Three books is a very manageable challenge so this one looks like fun. After Dark is a perfect introduction to Murakami; I read it for the last challenge. I'll probably try to read another one of his for the current one.